Road safety charity the IAM is offering drivers advice about coping with severe weather conditions. Before you set off, set your heater amd a/c controls because heavy rain can make windows mist up in seconds. Dangerous to be fiddling with heater and a/c controls when you need to concentrate even harder than usual on the road. Slow down. In the rain, stopping distance can be doubled. Putting more space between you and the vehicle in front also helps to avoid spray, especially when following a large vehicle. Keep your eyes on the road ahead and plan your driving so that you can brake, accelerate and steer smoothly because harsh manoeuvres will unbalance the car. Strong winds can also unsettle your car and even change your direction of travel. Grip your steering wheel firmly and be aware of the effects of the elements on other road users, especially motorcyclists and flat-sided vehicles. If you have cruise control, switch it off on wet roads. Though most cruise control takes its speed reading from the final drive you can still lose control if you start to aquaplane. See and be seen. Put your headlights lights on – as a rule of thumb, whenever you need to use your wipers you should also turn your headlights on, and before overtaking put your wipers on their fastest setting in case you get splashed. Remember DRLs only light at the front. Your rear lights do not go on with them. If you can’t see where you are going to come out of the water, such as when approaching flooding on a bend, think twice about starting to drive into it. In deep water never take your foot off the accelerator, as this could allow water to travel up the exhaust pipe. Remember that many diesels have low set engine air intakes. Any flood water sucked up from this into the engine cannot compress in the combustion chambers so the con-rods will bend and the engine will be wrecked. 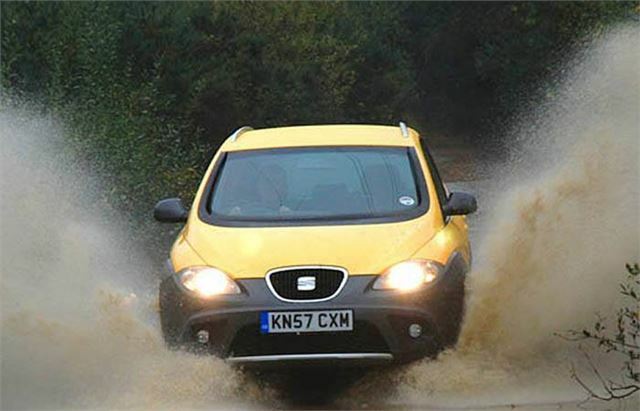 Ine IAM's Chief Examiner, Peter Rodger said: "A suddenly very wet road surface increases the chances of slipping when braking or steering, which is a problem not just for motorists, but cyclists and motorcyclists too. “When driving in wet conditions remember that stopping distances will increase, and visibility will be reduced. Drop your speed and give yourself more time to slow down. Check your tyres too. The only reason they have sipes is to allow the water to escape, the shallower (worn) or more labyrinth (4x4/M+S) the sipes, the slower you need to go to compensate.